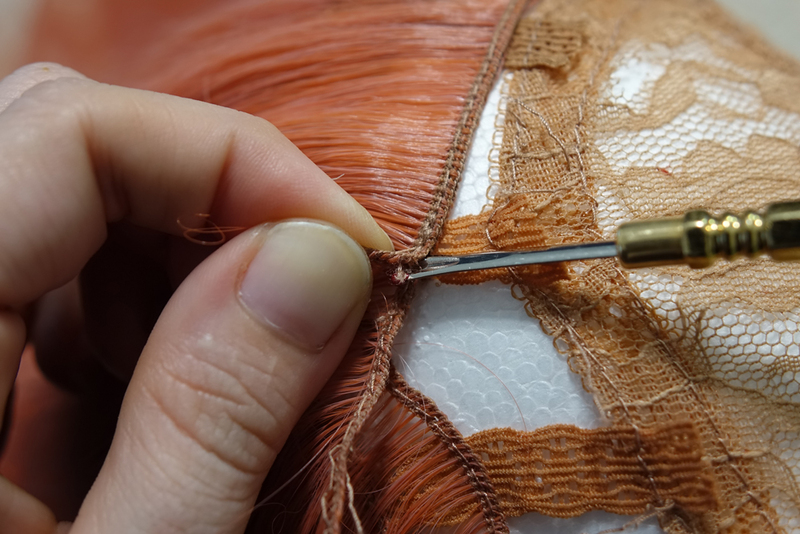 Someone new to pulling apart a wig might find it easier to cut free the wefts from its base, leaving all the excess elastic, thread, and fabric beneath it. 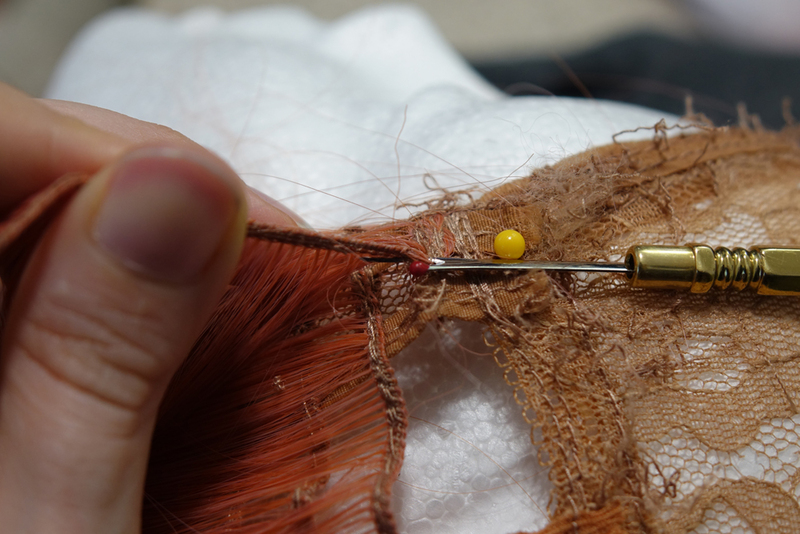 But it is possible to pull away all of the wefts with a seam ripper, saving the base for potential future projects. 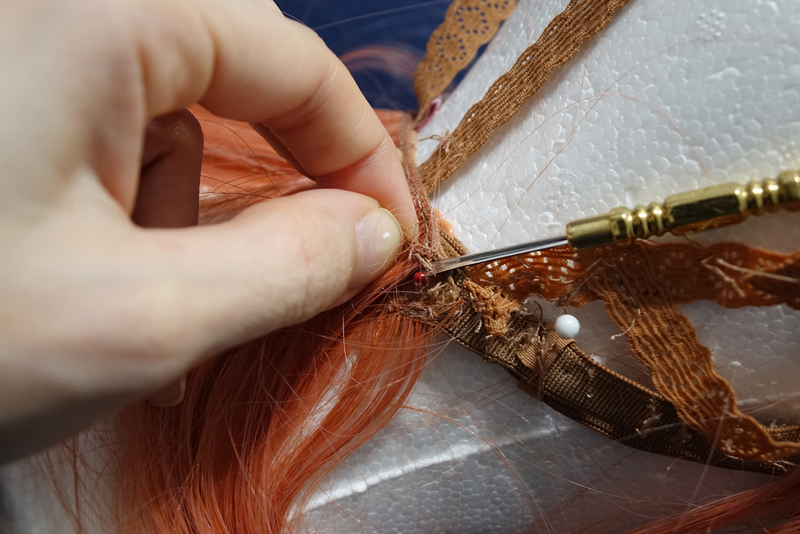 This tutorial will go over how to pull apart an entire short-wig, but this process can be used for any wig including long, curly, or even specialized updo wigs. On average it takes me 2-3 hours to completely rip a shorter wig. Longer wigs, which require more detangling, requires more time. Check your weft structures along the elastic. Are they all horizontal? Are they in different directions? 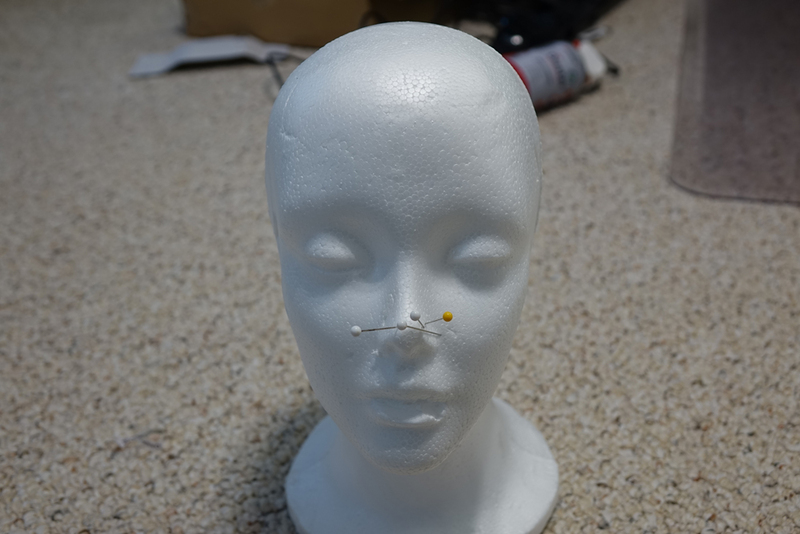 Take your ballpoint or t-shaped pins and secure the wig to the wig head. It doesn’t have to be perfectly tight or even in the right direction. The point of the wighead is to provide support to hold down the base portions as you seam rip so you can use both your hands more effectively. Don’t be a fool and forget this step like I did for the first 15 minutes. 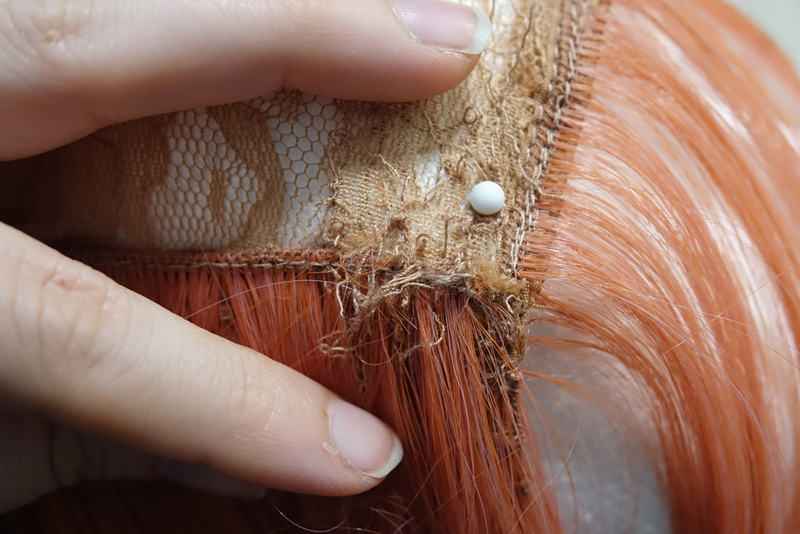 The place to start is always at the skin cap which has the most amount of covering fibers for the wig. 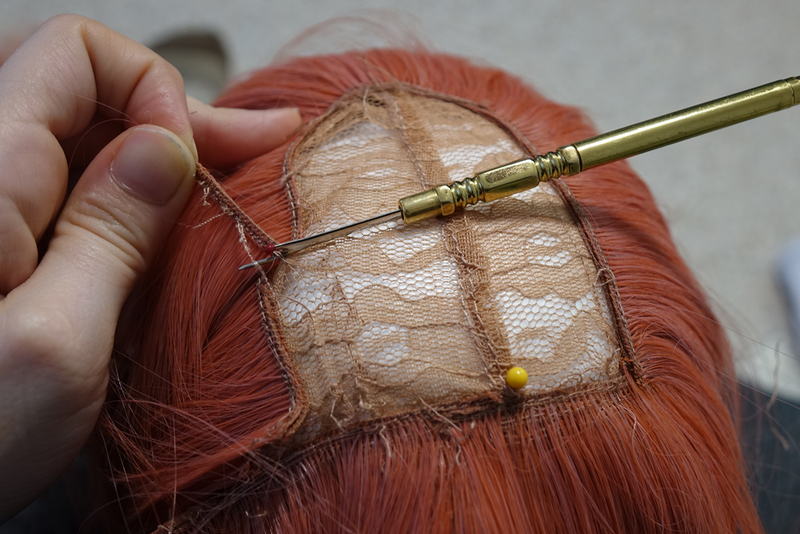 Using your fingers or potentially the pointed end of a comb, pull the skin cap fibers from the rest of the wig. 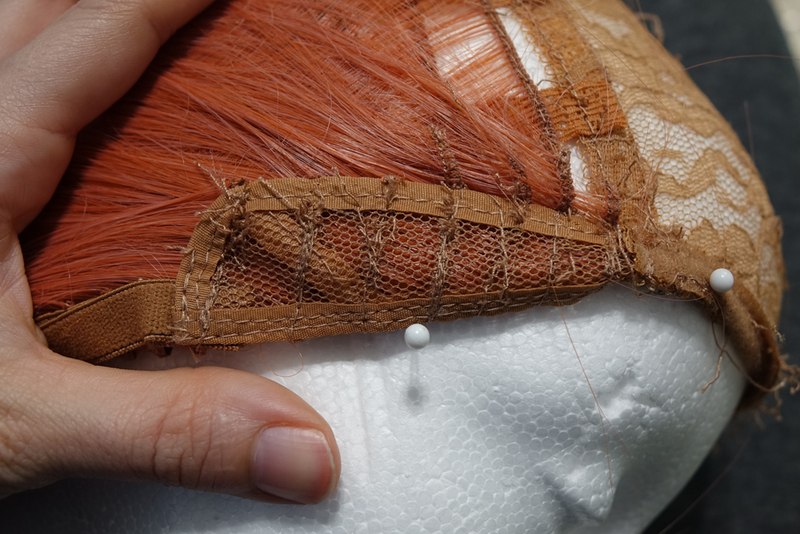 The point is to separate this huge chunk of fiber away from the set of sewn wefts that are along the edge of the skin cap. Use a large clip or several smaller clips to pull these out of the way. Some wigs may have more than one set of wefts sewn along the end of the skin-cap, but generally there is only one line of wefts holding it down around the circular portion, and one weft along any straight edges. 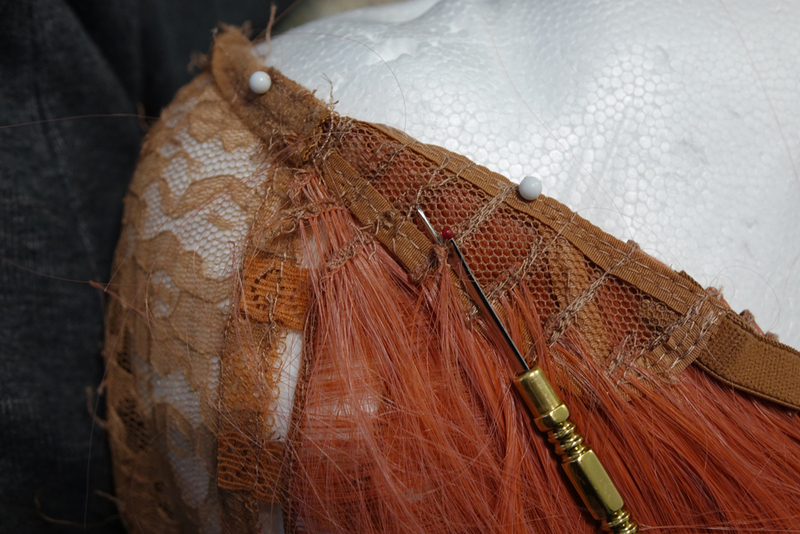 Find the topmost weft along the skin cap and slide your seam ripper into the starting edge. If you find the starting edge is hard to grab, you can also slide it into the thread at any part beneath the weft. Tackling the removal from the bottom is far easier than trying to pluck the threads from the top, as you may pluck fibers or damage the weft weave. The smoothness of the skin cap makes for an easier guide. Pull up the weft as you pull it free, and at anytime it tenses to a point it wont move, continue to rip the threads. Weft stitches are generally wide, which means it's easy to pull the weft free for longer chunks than traditional fabric seams. Continue moving around until you’ve reached the end of the single weft holding the skin cap down. 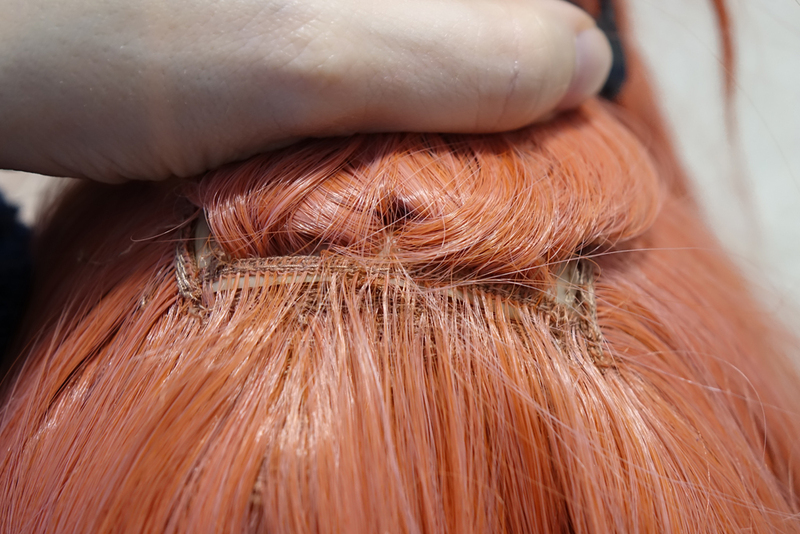 If more wefts are present, such as the straight weft on the front of that wig, pull those wefts free as well. 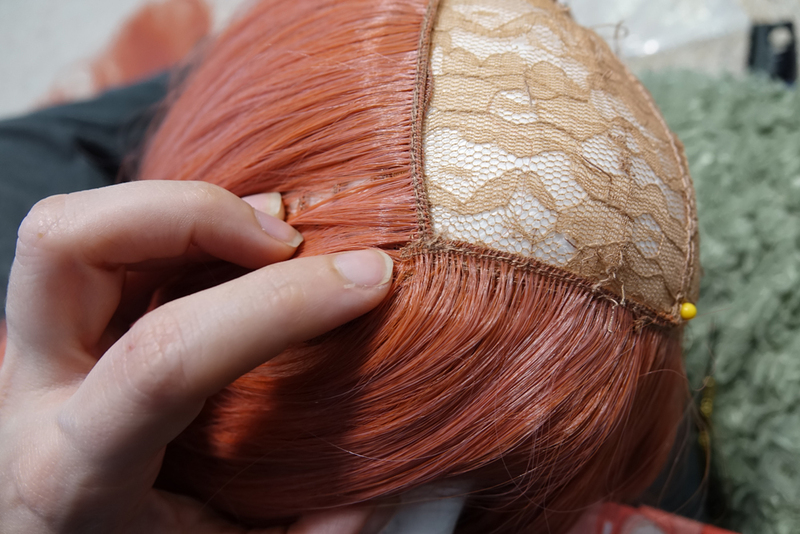 Always aim for the wefts that are on the topmost layer and work your way down. 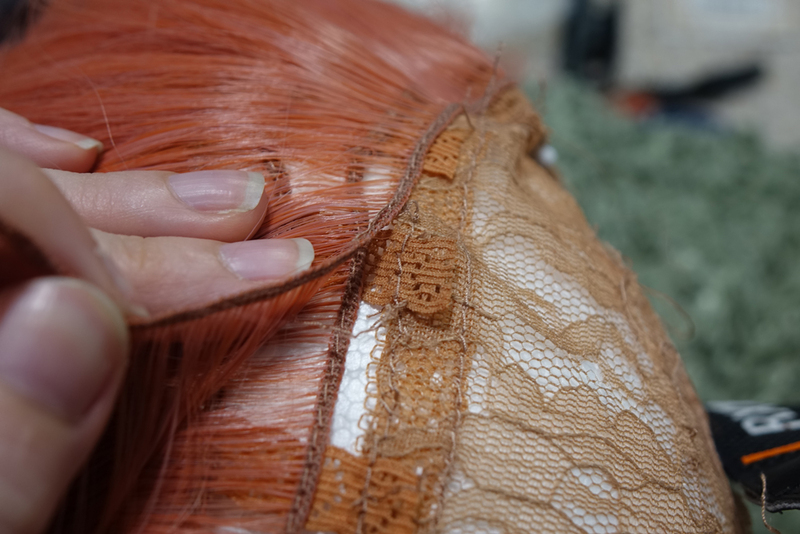 Sometimes you’ll find small portions of horizontal or vertical wefts that just slightly overlay the wefts you’re working on. 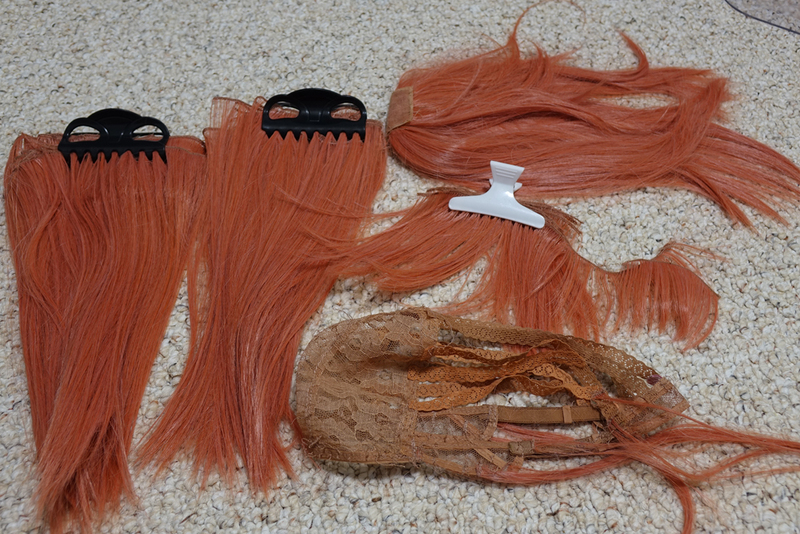 Rip them free enough just to pull aside, and continue working on the skin cap wefts. 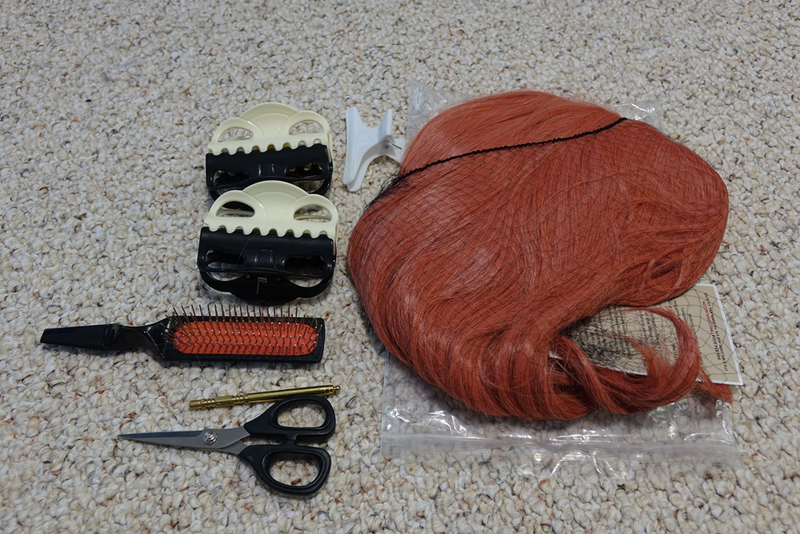 We’ll tackle those rather confusing forehead/bang wefts later. 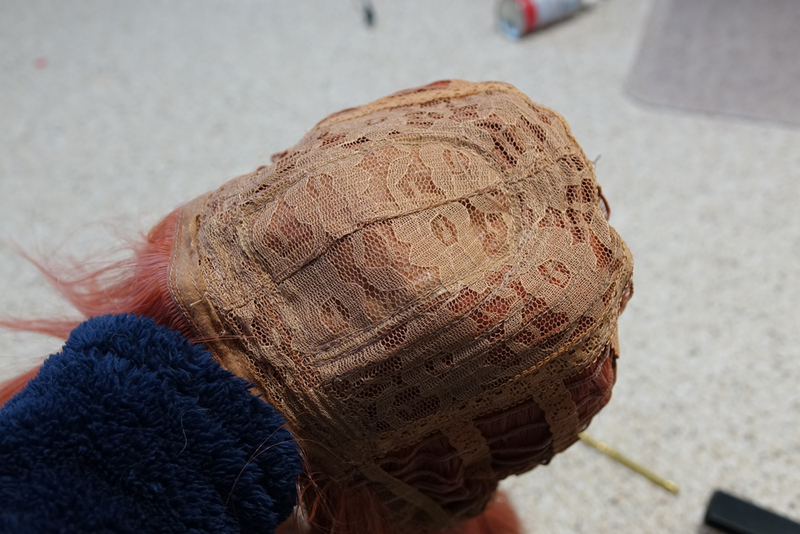 After all the wefts have been removed, the skin cap stitching can be seen beneath it. Find any spot on your skin cap (preferably a corner if you have them) to start pulling away the threads. 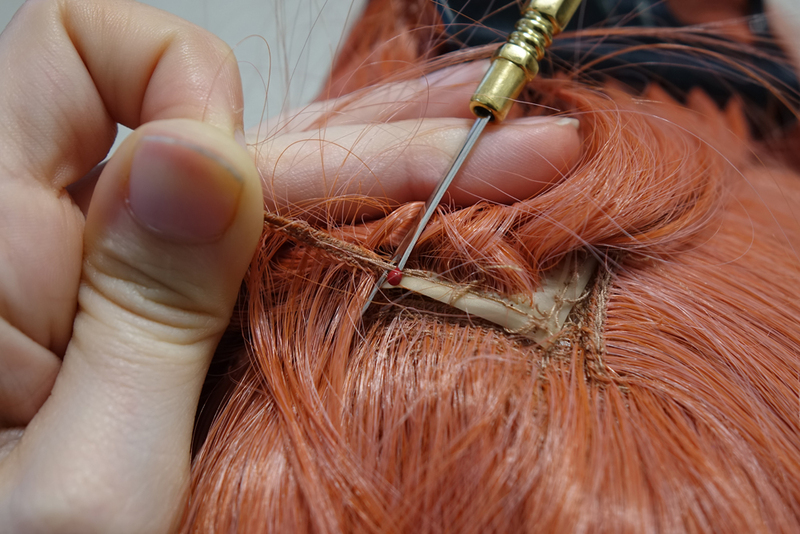 Once you’ve got enough grip to pull up the skin cap, you can snip them away from the bottom much like you did the wefts before. 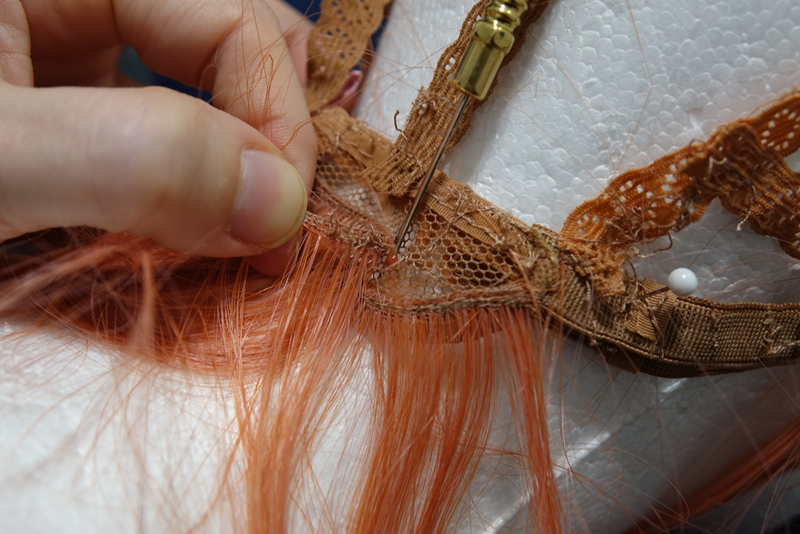 Again ripping the threads holding the skin cap from the top is much easier than trying to rip the wefts through the lace on the bottom. This will give you a clean bald spot on the lace. 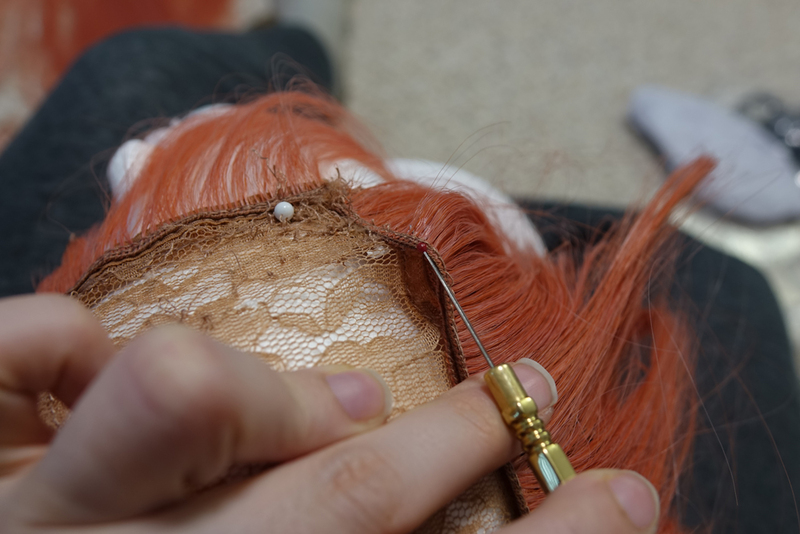 Skin caps can be re-attached to other wigs, moved to other parts of the wig to make more dramatic part lines, or even cut apart to become part lines for something like pigtails. 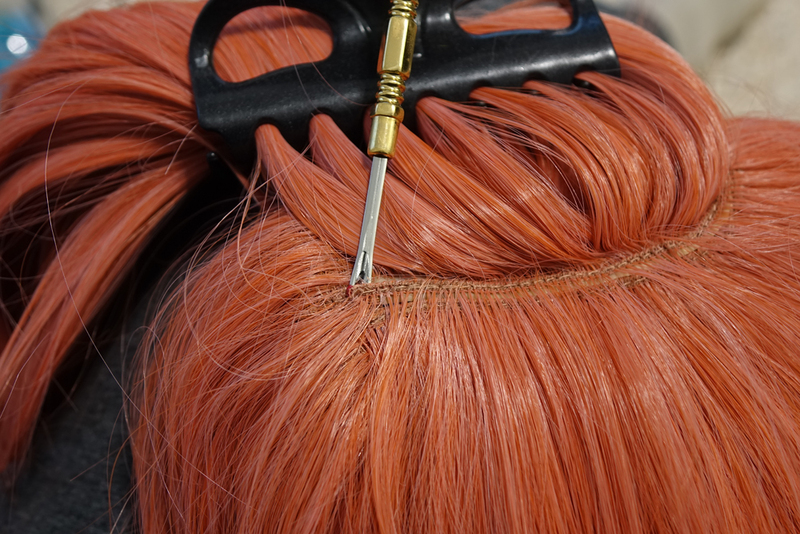 Again, the best way to tackle a wig is from the top to bottom. 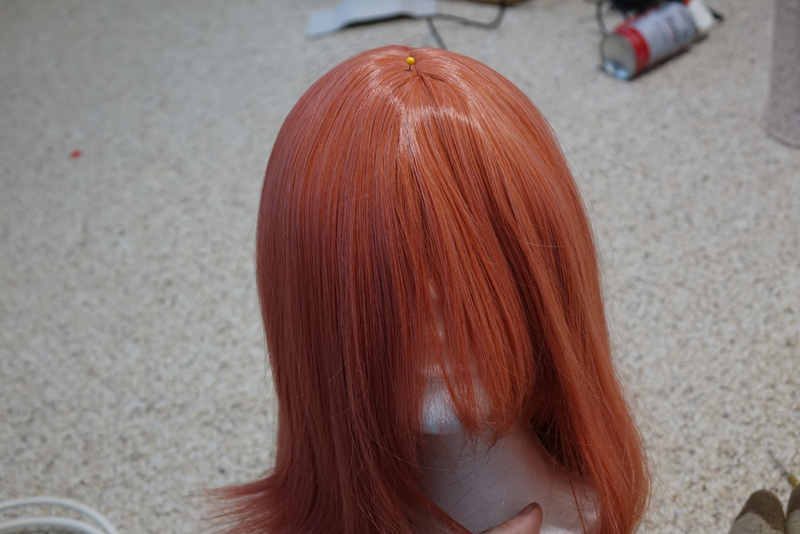 Generally the wefts around the skin cap that aren’t the bangs will overlay a good chunk of other wefts. 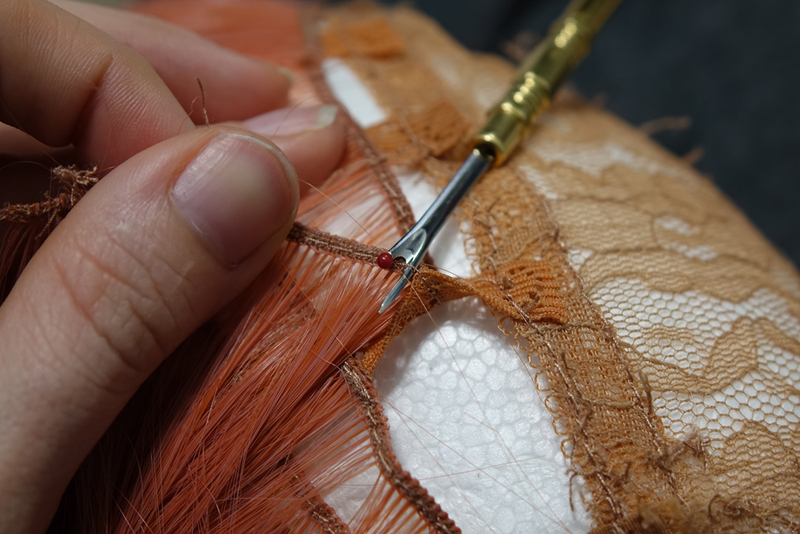 Carefully wiggle your seam ripper into the beginning of the weft to clear off the backstitching, then begin ripping threads as you pull it from the lace cap. 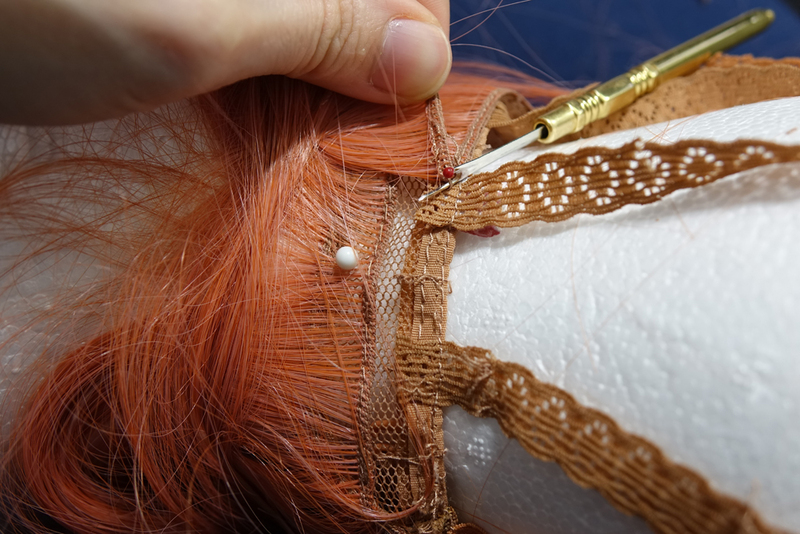 Sometimes pinning along the lace cap can also help in supporting the wig as you pull the weft. In some cases these wefts which are there for coverage might be doubled up. They should be easily pulled away as one solid unit from the wig, but the threads you rip do hold the two together. Take care to lay your wefts by their type on the nearby floor to keep them neat and organized. 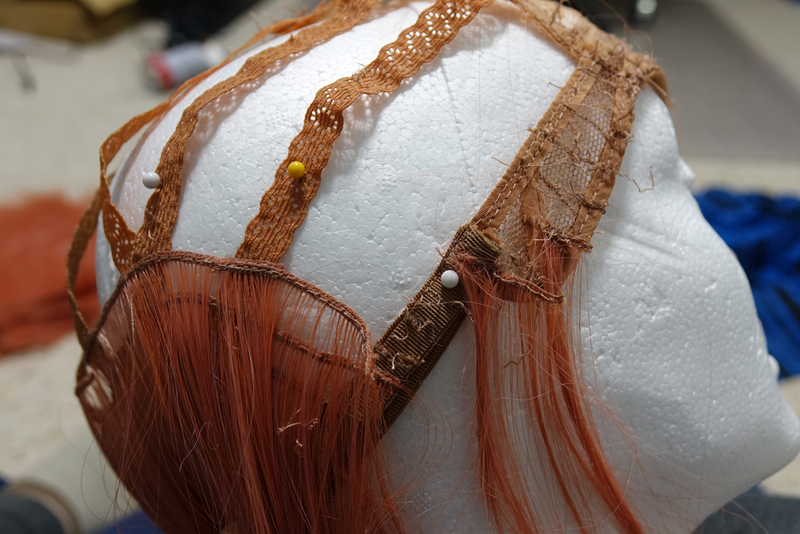 Eventually, the bang wefts will start to overlay the circular lace cap wefts. This is usually just before the transition from lace to elastic. Bang wefts can be a bit trickier to deal with as they are heavily locked on the ends, are usually thinner than the other wefts, and can be sewn in many layers depending on the type of bangs. Another common bang problem are fibers caught in sewing. As you pull away the weft you may realize that there thread that is not attached to the weft, but has still locked the fiber in place. Seam ripping these stitches can be nightmare fuel, so simply attempt to pull the fiber as free the best you can. If not, it might be good to cut the fibers away and move on. 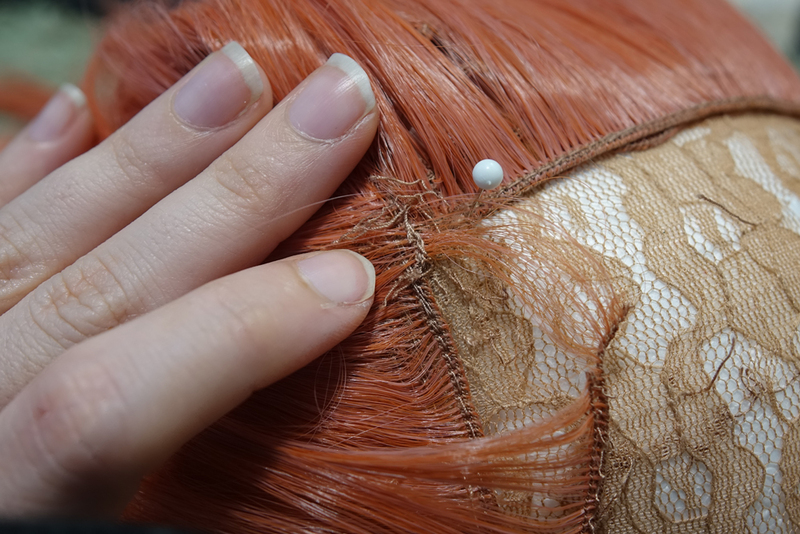 Once majority of the bangs have been pulled away, you’ll be left with the wefts on the very front, and the weft lining the lace. A common issue is that the bang wefts have left massive knots along the lining weft, which makes it basically impossible to pull at the edge. If the ends seem difficult to grab or rip through, you can alternatively rip from the side of the weft and pull it towards the beginning to more easily tackle the backstitch. From there you can continue around the rest of the lace and free it from the weft, revealing the stitching to the elastic. 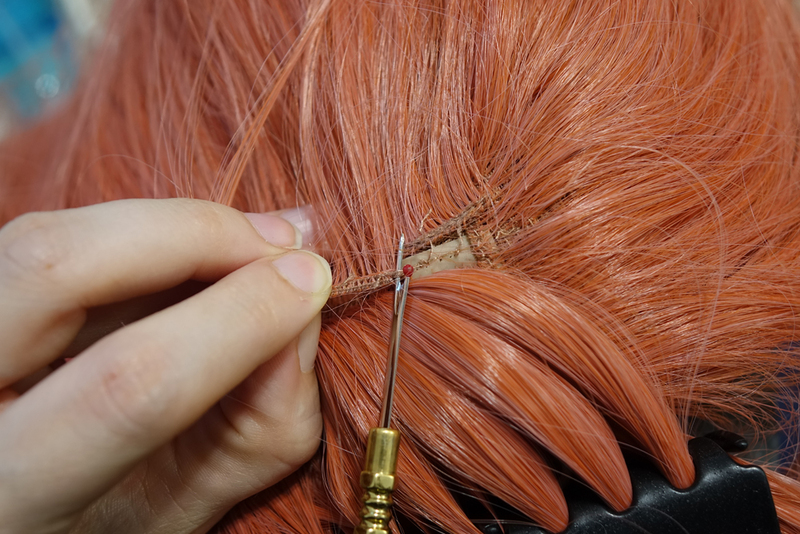 Be super careful not to snip the thread around the elastic however, or you’ll lose the support needed to pull the wefts from the elastics later. 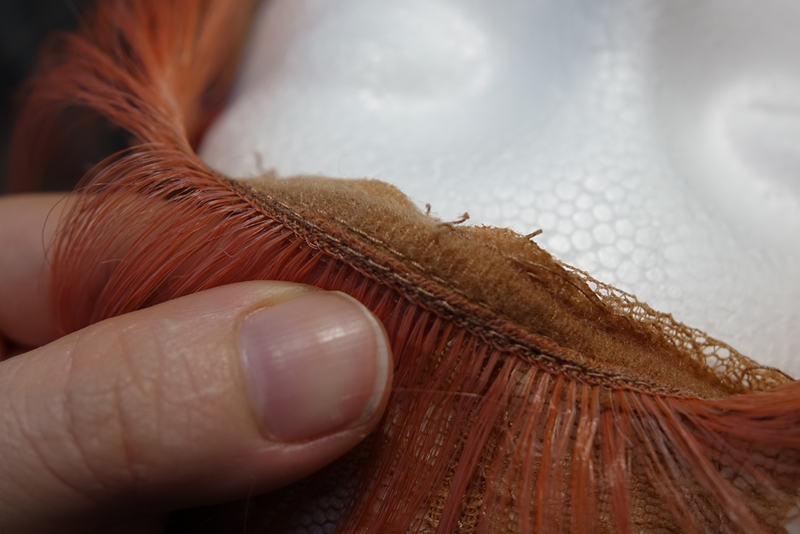 The final bang weft of a non-lace front wing generally has two lines of wefts: one on the topside of the cap, and one on the bottom. 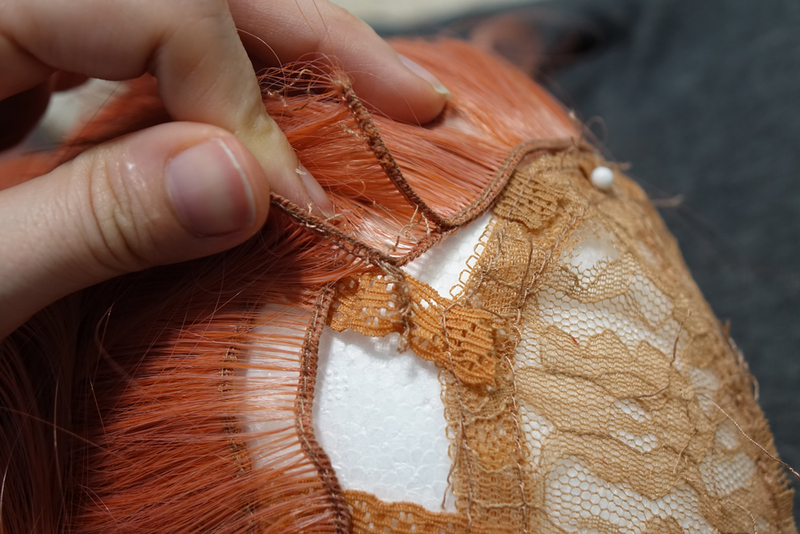 Wigs change up which weft goes in there first, so check both to see which one has more stitches in it. 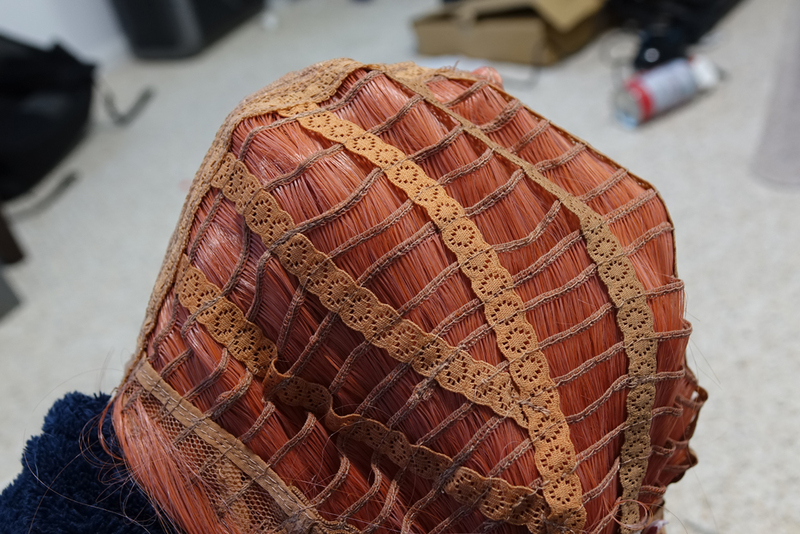 In this wig, the top wefts went first, and the bottom were sewn after. 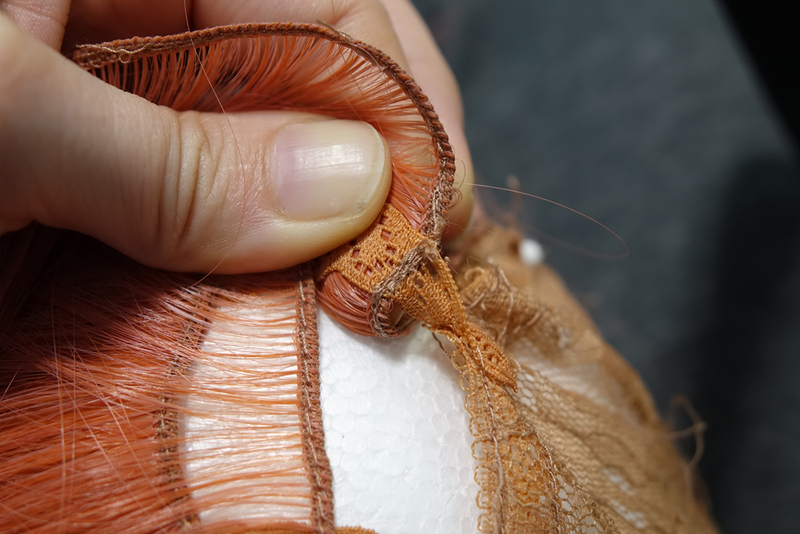 To make seam ripping easier, I first pulled away the wefts on the bottom, which loosens the thread that restricted the fibers on the top, and allows me to simply rip away the top weft. This gives me a completely clean lace cap! If this portion has an official name, I don't know it, so I’m calling it ear lace. 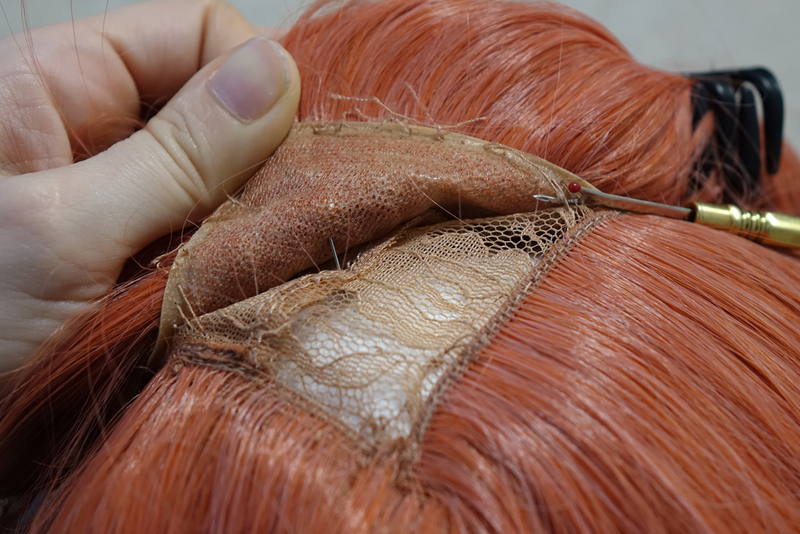 The reason that this gets its own section is that these wefts are incredibly hard to start ripping because of how they are attached to both the edge, and the netting beneath it. 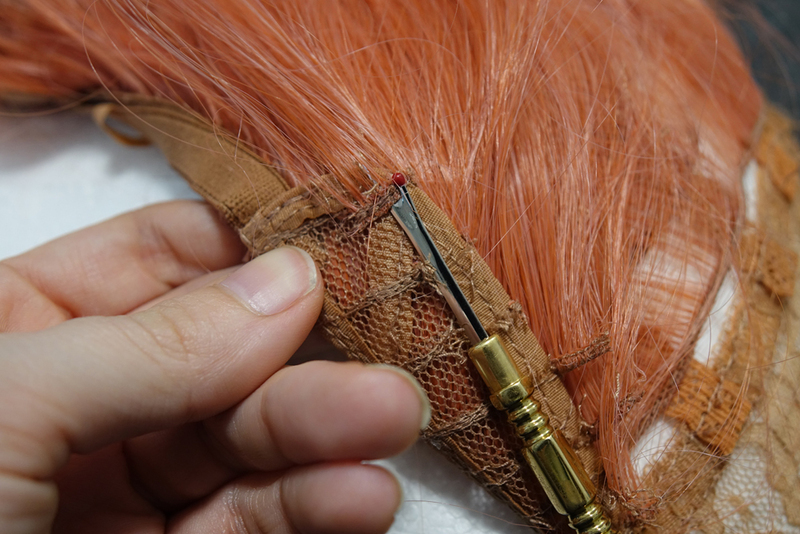 It’s best to completely free these wefts from the ear portions before pulling them free from the elastic, simply for the sake of efficiency. There are two methods to start these, and it depends how willing you are to save the entire weft, or how clean you need the base cap. 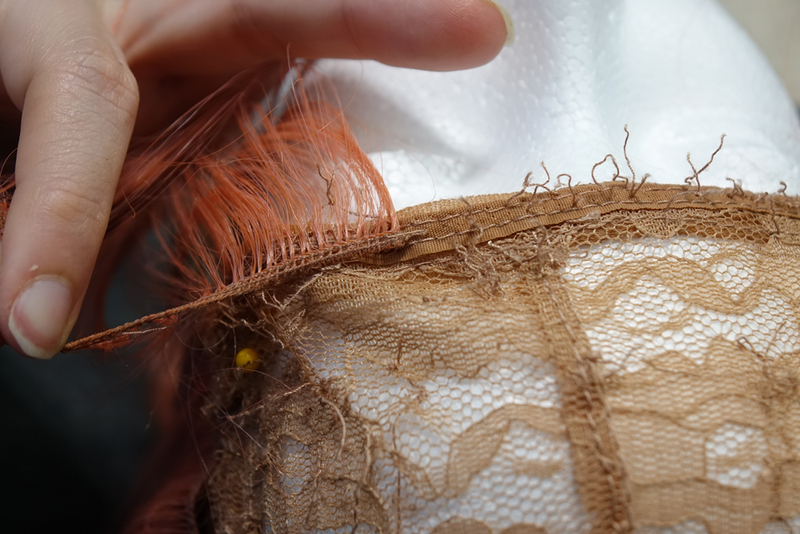 Underneath the ear lace you’ll find that the wefts have been initially sewn to the from the bottom, and then further sewn in place with another stitch. 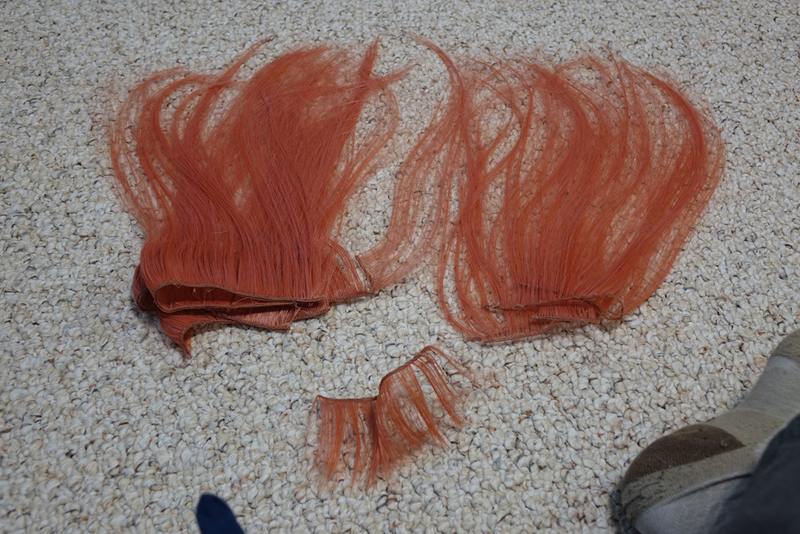 The netting is fragile, as are these wefts that have been stabbed to death with the needle. 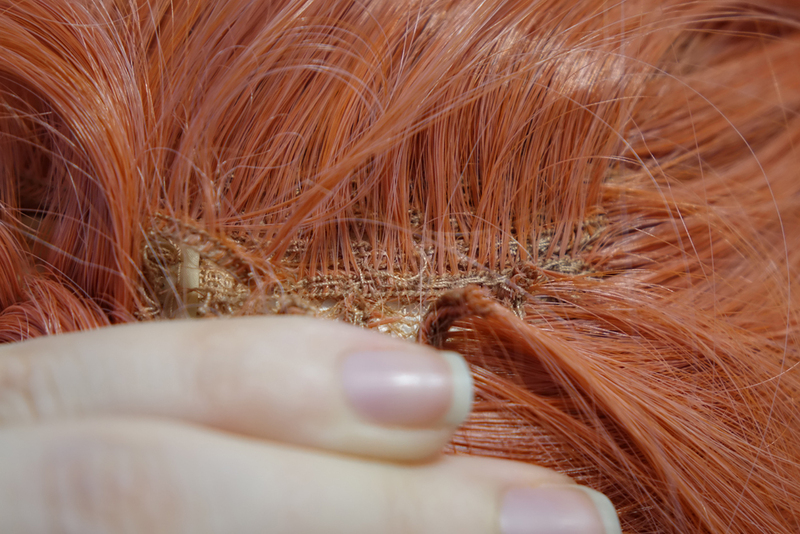 If you want to save the entire weft and completely clear the ear, check both sides of the wig and find the fibers that appear to have less stitches over the weft. Wiggle your seam ripper the best you can beneath the beginning of the weft and attempt to avoid both the netting and the rest of the weft on the other side. The locked stitches extend all the way to the curved edge, so it requires patience in order to fully free the weft. An alternative is to simply start your seam ripping from the topside, and ignore the bottom side part of the weft. This avoids all the locking stitches, and means you wont need to deal with the mangled weft fibers. Slide your seam ripper along the curved edge of the ear lace, or use a pair of scissors to cut the weft right along that outer curve. That gives you a clean edge for you to grab onto with your fingers, and easy access to pull the weft up from the ear lace. Of all the parts of deconstructing a wig, this is the easiest and yet most time consuming one. Start with the top most weft from your pulled away ear, and tug it towards the first elastic. By pulling it up and away from the elastic, the tension will reveal that first stitch that holds it in place, making it easy to rip open. So long as the fibers have not been back stitched, it should pull after the first little cut and you can move onto the next portion of elastic. Once you get to the end, simply rip it from the other side of the ear-lace until its completely free! 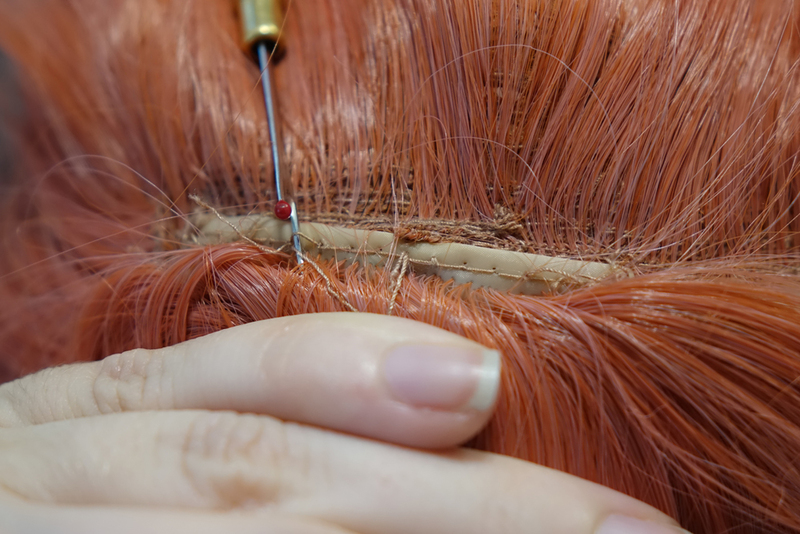 Sometimes while going around you’ll find wefts that have been layered, or started on the elastic which means there is plenty of backstitching. This can make it really hard to pull it away effectively without destroying the the entire weft and the elastic. 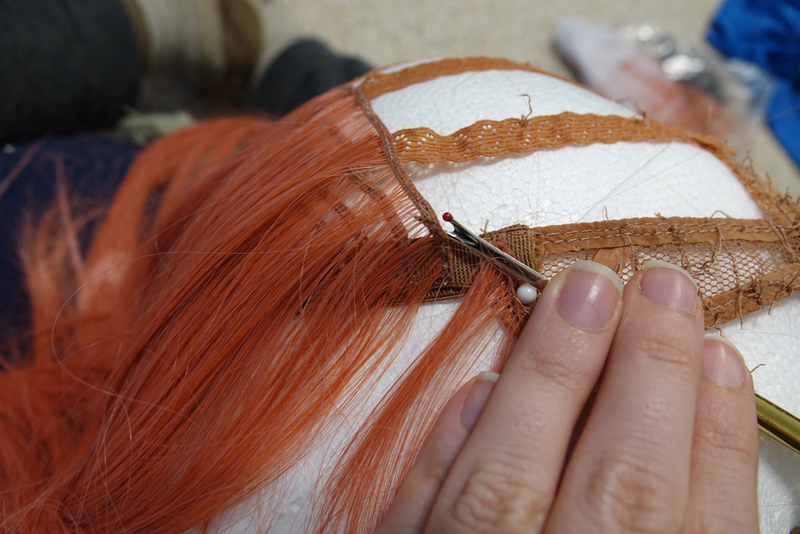 The easiest means to tackle it is taking advantage of the two wefts layered on top of one another. Either starting from the middle, or even from a point where it can be lifted, slide the seam ripper between the two wefts. This gives a stable place for the seam ripper to guide through, and saves the elastic from being torn to shreds and leaving excess unneeded fabric at the bottom. From there it is up to you if you’d like to tear apart doubled wefts, or keep it as one long strand. More than likely it will pull apart on it’s own naturally the more you tug at it. The next point of struggle is the thick elastis below the ear-lace. Again these wefts are heavily backstitched to hold them in place. Tackling the backstick from the inner edge of the elastic, versus starting from the beginning of the weft is an easier means to pull it away. Alternatively- don’t bother with the small portion attached to the elastic all together. It usually is destroyed by all the heavy back and forth stitching, so simply cutting it away from the elastic is easy, and all that's lost is maybe 1CM of weft. 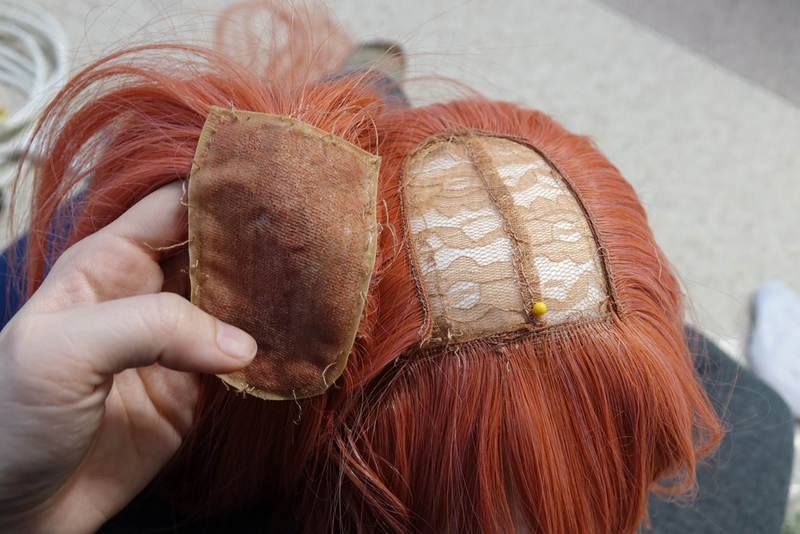 Also be aware that the longer elastics will be harder to keep steady the more the wig is pulled apart. Using pins to hold the elastic in place will ease the process. The base of the nape is built similarly as the ear lace. 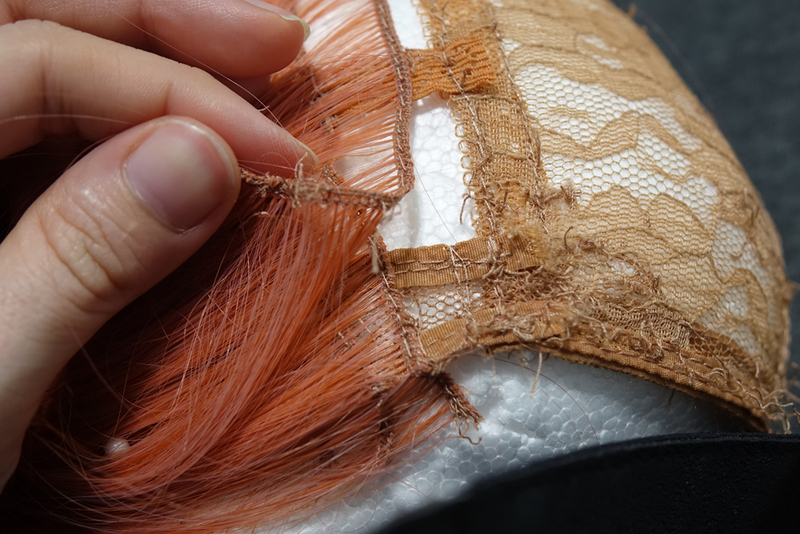 Its surrounded with sturdy bias tape, as well as a netting in the center which the wefts are sewn on. 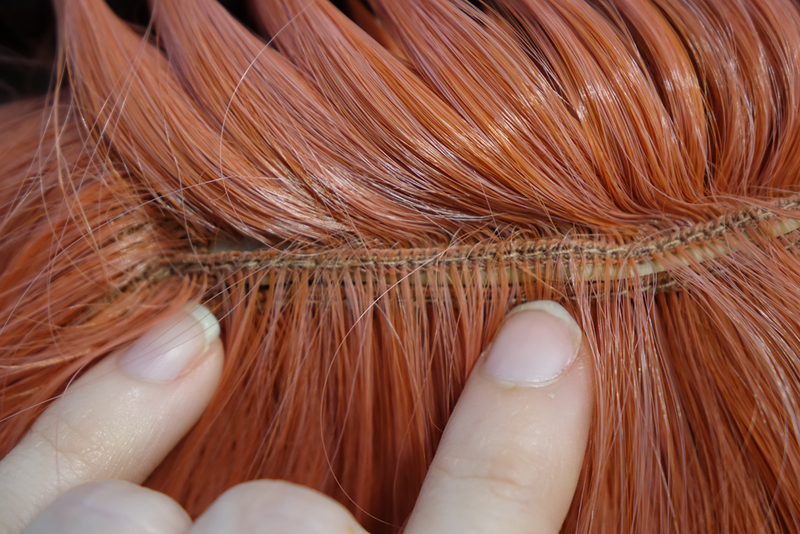 They are also overlapped in many different directions, so it’s good to be aware of where the wefts are crossing one another and always starting with those wefts on top. The top weft is difficult to rip from the center, but usually one end can be pulled up to expose back stitching to rip. Again simply rip, pull, and slice open the threads. 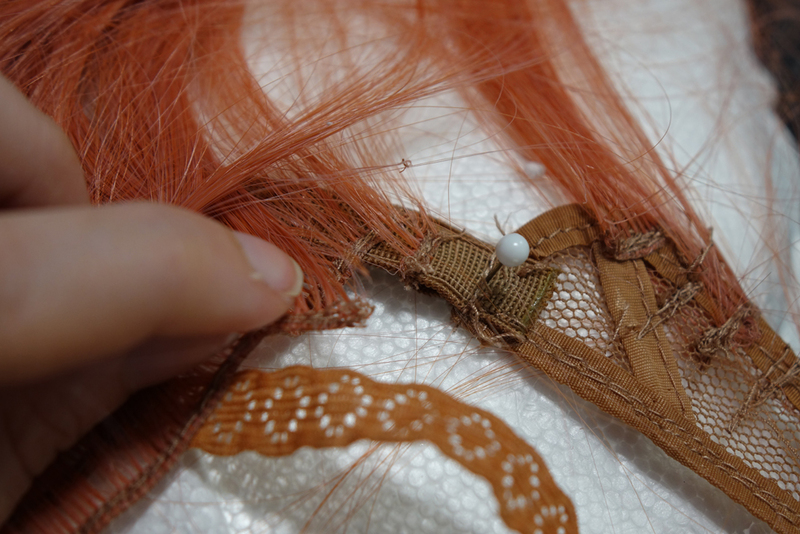 As you pull it across, the weft will come up, but not the elastics or nape base under it. 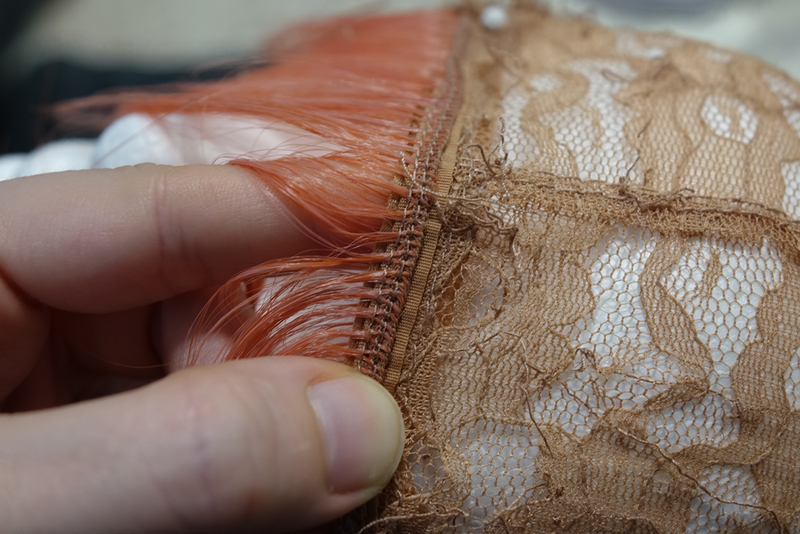 As you reach the wefts on the netting, be careful to snag only the threads and not the netting beneath it or risk excess fabric to the bottom of your wefts. This is the final fibers that require ripping! 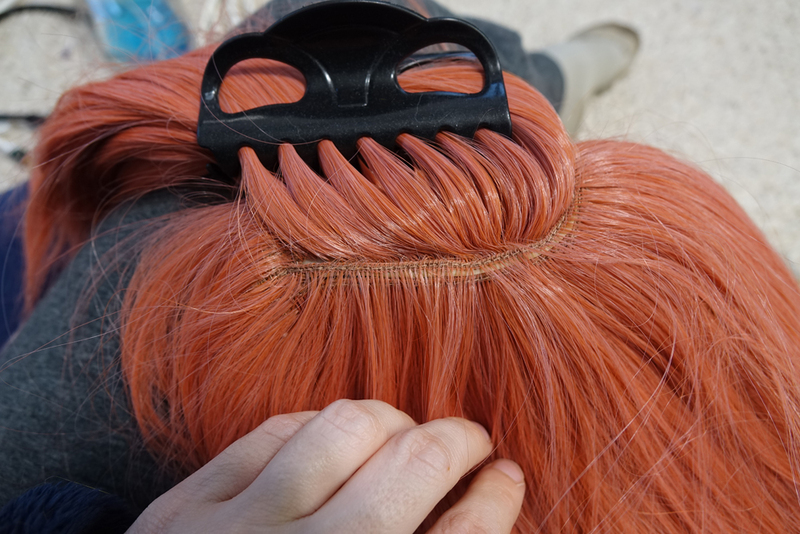 Using the hair clips from before, organize your wefts by its different widths and lengths to better place in future projects. 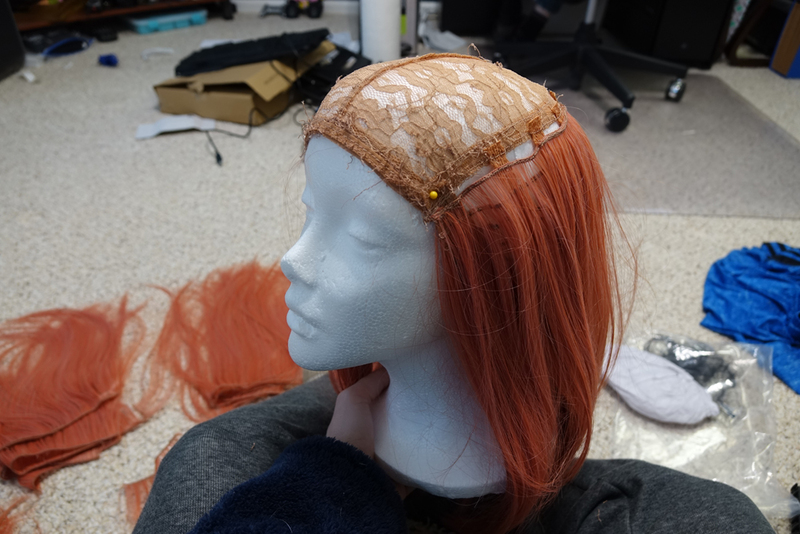 The wig cap as well can be saved as base draft for future wigs, or anything else that might require elastic or hair shaped lace!